When you are out in nature, do you often miss some interesting details in the view in front of you? It’s easy to do. For some time now, I’ve been working on seeing things a bit differently … trying to identify exactly what caused me to take a double-take … looking for interesting details in what I’m looking at … just trying to “see more”. What did you see? In many ways, this image is “too busy” for me. Did you see the criss-crossing water cascades? The rocks as they angled this way and that way? The downed trees in the stream? What about the start of fall colors in the mountain landscape? There are many things you can see in this one image. Although I often try to capture the entire scene, sometimes it pays off to stop and “smell the roses”, while checking out all the details. And creating a “less busy” image can bring more attention to more notable, specific details and make a more interesting image. In this case, the red rocks in the foreground captured my interest. So, I moved a bit closer to the red rocks, removing most of the “distractions” in the above image. 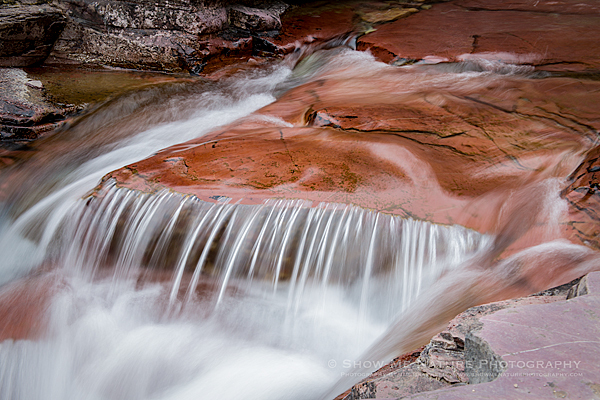 I absolutely loved the cascading of water over the red rocks. But when I took the time to really study this blown-up view, other things began to appear. What do you see in the following image? Well, several things stood out for me. First, the wonderful coloration of the main red rocks, as well as the supporting rocks around them. Then there are the many cracks in the red rocks, which can make our eyes wander throughout the image as our eyes try to find where the lines are going. Observing how the water flows along “the path of least resistance” is very evident. And the one thing that really captured my interest was the “mini waterfall” created by the water flowing over the lip of the red rock. Kinda reminded me of the many movies I’ve seen where someone is standing behind the waterfalls, looking out through the falls, while staying dry! I think this is a good reminder for all photographers to slow down and really take in the scene. You will most likely “see” many more images that you can make. 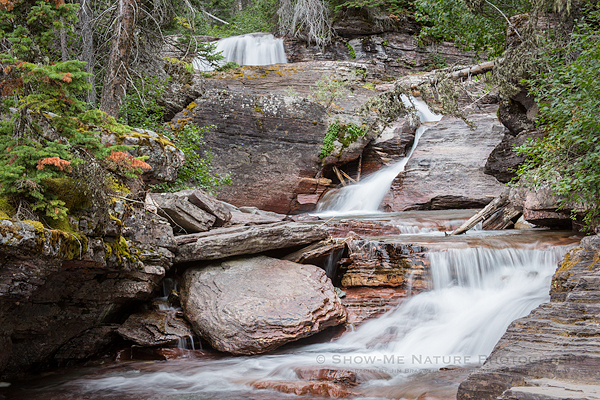 Tags: 2018, Blog, Glacier NP, landscape, Montana, National Park, nature, nature photography, photography, St. Mary trail, summer, travel, waterfall.